This ultralight 12", fd4 dobsonian telescope is particularly dedicated for travelling and easy transportation. 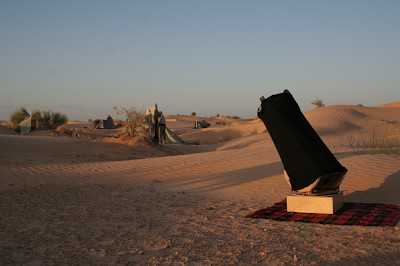 Usually accepted as a hand luggage in aircrafts, it is the ideal instrument for mobile astronomers, flying to the very dark skies, in Chile, Maroco, Namibia or Australia. It can be carried in its bag on shoulders or even on the back, when hiking in the mountains. This is a REAL telescope, without compromise in terms of stability, stiffness and robustness. This is also the ideal instrument for easy and sudden observations. You can keep it fully assembled and carry the hole to your garden for plug and play observing cessions. This Travel scope can be similarly built for 14 or even 16" optics. It can be also built with composite carbon panels, for an extremely lightweight structure. - Structure without optics, including height 12mm carbon truss and lightweight helical focuser: 2300 Euro. - For example, the whole instrument with optics by Nichols Optic, UK: from 3470 Euro. - The whole instrument with optics by Mirrosphère, France: from 4300 Euro. For any enquiry, please contact us. We can help you in order to minimise the impact of exchange rates and transportation costs.